Problem, My red-dyed hair had faded and grown out, leaving me with multi-tonal hair, and not the good kind. 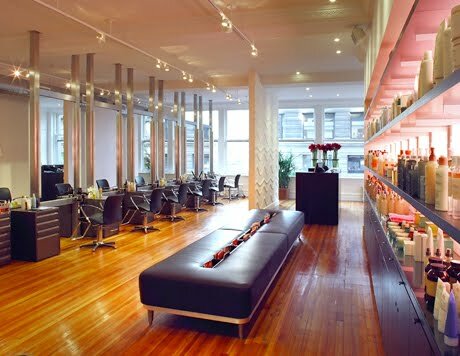 Solution: A trip to the Ted Gibson Salon in Flatiron, an Inoa Haircolor Session with haircolor rockstar Jan Marie, and later on, a blowout with the super sweet, super talented Devin Toth. Jan Marie came highly recommended by one of my favorite people in the whole wide world, Jamie of The Beauty of Life Blog. A fellow faux redhead, I know that Jamie would only trust her gorgeous locks to the very best hands in the industry. Jamie’s hair always looks amazing, so naturally I booked with Jan Marie to gain some of that fabulosity for my own mane. When I walked in and finally met Jan Marie, things just clicked. Not only is she super nice and ‘with it’ (speaking in the pop culture sense, of course), but her intuitive methods just make sense. She asked me what I wanted, and then immediately got to work performing that good ol’ haircolor magic. Using ammonia-free Inoa, Jan Marie custom-blended a true red hue for my locks. While I was waiting for the color to set, I was treated to a delicious hand and arm massage to pass the time away. After a rinse and a super sleek blowout done by Jan Marie herself, I felt like a whole new woman.We played it safe with the color this time around, but Jan promised something extra special for the next time. The following week, I had the opportunity to visit the salon once more, only this time for a blowout with the amazing Devin Toth. Not even one week later, I had the opportunity to visit the salon again, this time for a pre-Makeup Show blowout with hair’s rising star, Devin Toth. Devin gave me a gorgeous quicky blowout, preparing me to face the makeup-loving masses. For world class hair treatments, be sure to see Devin and Jan Marie at The Ted Gibson Salon. You will love the result. * I paid for the hair coloring service. The blowout with Devin was complimentary.